specializes in national and international patents for inventions in wide circle of technologies; highly experienced in patent searches, legal proceedings and unfair competition matters; speaks Ukrainian, Russian and English. 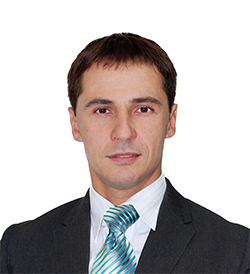 Patent Attorney Mr. Mikhailyuk and his department provides the full range of high quality legal services related to patent registration in Ukraine, prosecution, and litigation. For more information on patent registration procedure in Ukraine, please see an Overview of Patent Registration System in Ukraine and information concerning entering the Ukrainian National Phase of a PCT application. If you have any specific questions or need professional advice of the Ukrainian Patent Attorney please contact Mr. Mikhailyuk.